Picking custom papers from a paper supplier, I designed a two-color wedding invite with envelopes and reply card. 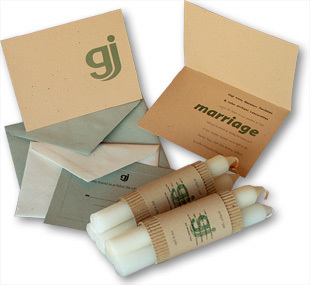 For the invite I created a "logo" for the event, nestling a G and a J together to represent the union of Gigi and John. The favors were a cluster of candles with a handmade packaging made from corrugated paper, laser output and a rubber stamp.